Bed & Breakfast Dannevirke is a couple of kilometres way from Autobahn A7 between Flensburg and Hamburg. you will arrive at Ramsdorf. Turn left towards Owschlag on Ramsdorfer-strasse, which goes into Dorfstrasse. 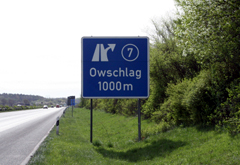 Follow the road for about 2 kilometers into Owschlag. Turn left on Steinsiekener Weg and after 50 meters turn right on to Flacksberg, which you follow for 150 meters and then Bed & Break-fast Dannevirke is on your right hand.